This year the Minnesota Region of the American Red Cross honors seven people whose humanity, generosity, and courage show us the best of what we believe a hero to be. Chosen for acts of bravery, kindness, and service ranging from supporting military veterans to donating gallons of blood, these people inspire us to be the best humanity can be every day and during times of crisis. Click on the links below to see their video stories. Or, click here for the video play list. The road from a refugee camp in Kenya to community hero in Minnesota is a long one. But Mohamed (Mo) Ahmed has traveled that road, bringing with him the spirit and action of helping others. Today, as a youth soccer team coach for more than 10 years, Mohamed continues to give time, money, and guidance to disadvantaged and diverse youth, including Somali, Oromo, Hmong, and Latino players. His time devotion alone adds up to more than 300 hours of volunteer service every year. “Mohamed has set-up a wonderful mentoring network with himself and former coaches, contributing physically, financially, and emotionally to the youth on these teams,” says Michelle Swanson, who nominated Mohamed for the Community Hero Award. “It’s hard to explain everything that this network does,” says Swanson. The teams play in multiple tournaments in the United States and Canada. One team has won several regional and national tournaments under Mohamed’s leadership. But for Mohamed, coaching is about more than building winning teams. For him, coaching provides an opportunity to give struggling youth, especially those new to this country, guidance that he needed as a new boy in America. Kids who might otherwise be unable to afford club soccer can participate at minimal cost, giving them soccer and life skills helpful for doing well in this country. Five years in a refugee camp was a long time, and a long-time ago, for Mohamed, whose transition and triumph makes him most deserving of being our 2017 Community Hero. Many people are needed to help save the life of a cardiac arrest patient, but few are attributed with being the guide needed for a man trying to save his wife’s life. Very early on the morning of June 15, 2016, Julia Weegman was that person for Chris Jesmer when he called 9-1-1 for emergency assistance after finding his wife, Jeanine, unresponsive. “As a panicked husband who knew his wife was dying before his eyes, and as someone who had no experience with CPR, I felt totally helpless,” says Chris. Julia immediately provided Chris and his daughter with instruction for helping Jeanine. Julia guided them through moving Jeanine to the floor, clearing her throat, and beginning chest compressions until professional assistance arrived. Julia is a true first responder hero, whose compassion and training saved the life of a wife and mother when help was most needed. Among those helping to save lives every day is Gordy Kircher. A Red Cross volunteer with more than 200 hours of service for last year alone, Gordy gives selflessly to help those who need lifesaving blood and platelets. Gordy has for decades donated blood and platelets. While being treated for cancer and unable to donate, Gordy became a Donor Ambassador assisting other donors with reception and hospitality at the St. Paul donor center. Gordy’s efforts support the American Red Cross North Central Blood Services Region, which last year collected more than 248,000 blood units for hospitals and patients. Heroes like Gordy are critical to this lifesaving work. Human suffering comes in many forms, including the kind that drives someone to attempt suicide. On August 9, 2016, Mikael (Mike) Tekeste was walking across the Wabasha Bridge in St. Paul on his way to work when he came across a woman in that place of deepest despair. Without regard for his personal safety, Mikael grabbed the woman by her arms and pleaded with her not to jump from the bridge. She pleaded with him in reverse, asking him to let her die. He did not, and he stayed with her until first responders arrived. With assistance from several Ramsey County Sheriff’s Deputies, Mikael pulled the woman over the railing to safety. Mike’s action was a courageous and selfless demonstration of the Red Cross mission to alleviate human suffering in the face of emergencies. Vietnam veteran David (Dave) Winkler lives a life committed to honoring people who have served in the United States armed forces. On behalf of veterans, Dave attends rallies, speaks at high schools, serves as a member of the 8th Air Force Historical Society, and volunteers for the annual Patriot Ride benefit. As an active motorcyclist, Dave joined the Minnesota Patriot Guard Riders in 2006. Since then, he has been on numerous missions, honoring fallen heroes at memorial services. Dave’s volunteer service ranges from boots-on-ground work, such as shuttling people to and from parking lots, to leadership support as a charity board member. For Dave, his work is simply “the right thing to do.” This includes helping a fellow Vietnam veteran who’s unable to walk more than a few feet. Dave takes “Doc” to VA visits, patriot missions and funerals. “Most importantly, Dave makes regular visits to a friend preparing to die,” says Ray Guest, who nominated Dave for the Military Hero Award. In addition to honoring American military veterans, Dave has donated blood since 1970. Because of Dave’s work, many military veterans and their families feel less alone in the world, making Dave a true representation of honorable service helping others in need. Last year, in the dark of an early morning, John Marcella, Beau Foix, and Cody Hermann headed for duck hunting at West Two Rivers reservoir. While preparing gear in their boat, John heard a splash, looked around in darkness, and saw nothing. John thought the splash was odd. He could have ignored it, but thankfully he did not. Grabbing his headlamp, he looked more along the shore and on the dock, and noticed Cody was nowhere. Peering into the water, he spotted Cody face down and not moving. John yelled to Beau. They put a rope into Cody’s hand, but he did not respond. Cody, they later learned, had suffered a seizure. In the darkness, Cody jumped in the water while still wearing his waders. He plunged to the bottom and pushed from the ground, gaining momentum to get Cody’s face out of the water and his body closer to shore where John helped pull their friend from the lake. John’s phone, which earlier had no signal, finally had one strong enough for him to call 9-1-1- for emergency assistance while Beau started CPR on Cody. The Red Cross joins the Virginia community in celebrating and recognizing two remarkable youth who were courageous and selfless in their humanitarian actions. The 2017 Heroes were recognized on May 19 during the Heroes Awards and Centennial Celebration, which was held at U.S. Bank Stadium in Minneapolis. Thanks to an outstanding effort on the part of dedicated Red Cross supporters, including 921 guests and 65 volunteers, the Heroes Awards and Centennial Celebration raised more than $479,000 for American Red Cross programs and services. Many thanks to our guests and volunteers, sponsors and partners, centennial co-chairs, special guests and speakers, gala co-chairs, entertainment, and staff, who helped make the night a great night! Click here to learn more about our history, centennial year activities, and to share your story. For the fifth year, the stars aligned in Mankato for a successful Dancing With the Mankato Stars (DWTMS) on February 11, 2017. More than 2,500 people filled the sold-out Verizon Event Center to watch 11 couples and one group of religious sisters dance to support the American Red Cross serving Southwest Minnesota. The event was spearheaded by the DWTMS board and Dance Express. Thank you to everyone who helped make this event happen, including more than 30 Red Cross volunteers. Through sponsorships and donations, the event raised over $123,400. Click here to see more great photos. On July 23, 2016, the American Red Cross Minnesota Region, in sponsorship with Smiths Medical, held its 8th annual Run for Blood 5K at Lake Calhoun in Minneapolis. Considering there was a slight chance of rain throughout the duration of the race, the attendance of nearly 300 people was a great turnout this year. The 2016 Run for Blood proved to be everything but ordinary. Food carts, music, dance groups, and various stands were all a part of the event, but there was something even more important to the race. While the Run for Blood 5K might be about getting to the end of the line with family, friends, or solo, little do people know of the impact this run and walk event has on the surrounding community. Right now, someone in the United States needs blood or platelets every two seconds. 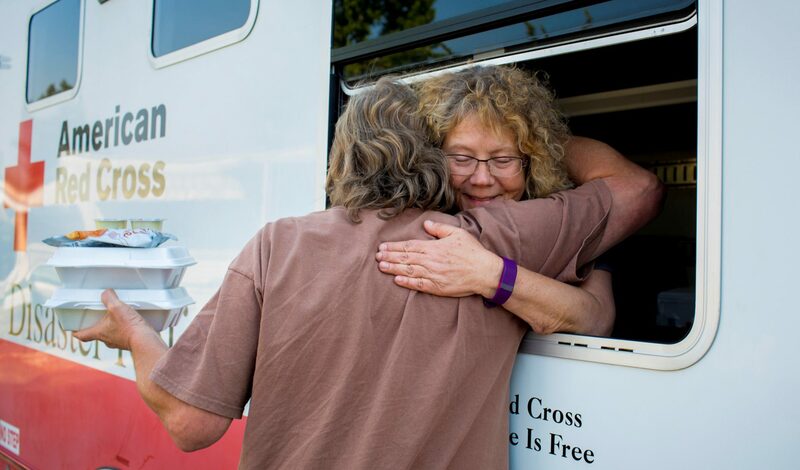 With the donation van onsite, many runners were able to give lifesaving blood and race proceeds to over 108 hospitals in the states of Minnesota, Wisconsin, South Dakota and Iowa. This race was and continues to be a great way for families, friends and coworkers to rally together and raise awareness for the need for blood. At 8:30 a.m., the runners and walkers began lining up at the start line, getting ready to show their physical stamina, strength, or a mix of both. In addition to the number of solo runners, the race would not have been as exciting without the various teams. Such teams included “Faster than Disaster” to “Walking Disasters.” While some groups may have been an understatement of their actual pace, everyone found one way or another to enjoy the 3.10 miles of the race around Lake Calhoun. It was encouraging to see people of all ages and size willing to come together and strive towards the Run for Blood ultimate mission: raising awareness for the never-ending need of blood. A number of thank you letters go out to a number of people. First and foremost, this race would not have been as athletic or competitive without the runners who gave some of their money to donate for a better cause and run or walk the five kilometers. Second, the sponsors, including presenting sponsor Smiths Medical, and hydration station sponsor Culligan, and tech T-shirt sponsor Western National Insurance, that helped fund the raise, continue to make these events happen. And, great thanks to the event volunteers! No matter the level of importance, the American Red Cross 2016 Run for Blood could not have happened without you and we are incredibly grateful for your work. While some of you were unable to attend this event, there are always different ways in how you can aid this blood shortage going on. There are four American Red Cross donation centers within the Twin Cities and all you need to do is schedule an appointment. Maybe the next time you hear the phrase, “Ready, Set, Go” you’ll think of a different phrase: Ready, Set, Donate by signing up for the 2017 Run for Blood 5K next summer! On May 6, the American Red Cross in Minnesota presented six awards that honored ten people for their heroic efforts helping others during great times of need. Below we share with you their inspiring stories. Duluth teen Bryden Bronikowski was honored with the Youth Good Samaritan Hero Award for helping to save the life of his young cousin. “Panic is your worst enemy,” says Bryden. “Fearing anything can go wrong.” Watch Bryden’s story. Nisswa Chamber of Commerce president Shawn Hansen received the Community Hero Award for being a vital part of daily coordination and communications during the windstorm disaster relief efforts in Nisswa in July 2015. “As human beings we have to focus on making the world better,” says Shawn. Watch Shawn’s story. Mike Clark of Eagan received the Military Hero Award for supporting the needs of people in the armed forces. “It gives me an opportunity to connect with people that are just really down to earth,” says Mike. “And they’re really thankful for knowing there’s somebody out there who cares about them.” Watch Mike’s story. Shoreview resident Jerry Nelson was honored with the Give Life Hero Award for his continuous blood donations and support of organ transplant families. “I’m not a hero for giving blood,” says Jerry. “Transplant patients and the people who get the blood are the heroes.” Watch Jerry’s story. Three Willmar police officers received Red Cross Heroes awards on May 6, 2016. Willmar police officers Mike Jahnke, Joshua Helgeson, and Jeff Liebl were honored with the First Responder Hero Award for putting their lives on the line to resolve a potentially tragic situation. “He’s a human being,” says Josh. “It’s our job to help him, and that’s what we did.” Watch Mike, Josh, and Jeff’s story. On May 6, 2016, Greg Pint received a Red Cross Hero Award. Montgomery residents Russ and Jenny Braith, and Lonsdale resident Greg Pint, were honored with the Good Samaritan Hero Award for putting their own lives at risk to save a man from a car going underwater. “I heard him hitting the buttons, the door locking, but no windows coming down,” says Russ. Watch Russ, Jenny and Greg’s story. Click here to nominate someone for the 2017 Heroes Awards. Post by Lynette Nyman/American Red Cross. You are invited to attend the 8th Annual Heroes Breakfast, which will take place on Friday, May 6, at the Radisson Blu Mall of America in Bloomington, MN. Tickets and table sponsorships are available online at redcross.org/mnheroes or by calling (612) 872-3241. During the breakfast you will hear powerful and inspiring stories about ten people helping others when they needed it most. The breakfast also is an opportunity to celebrate the Red Cross and its important humanitarian work. Thank you to our 2016 Heroes Breakfast sponsors. This year’s sponsors include presenting sponsor Land O’Lakes, matching gift sponsor US Bank, award sponsors CenterPoint Energy, CHS, Medica, St. Jude Foundation, Anime Twin Cities, UnitedHealth, reception sponsor Navigate Forward, and vignette sponsor Patterson Companies. And thanks to the Minnesota Twins for donating game tickets to our heroes.